The gold price you see every day on the news is not the real price of gold. Although it often says, "gold price", the price you see each day in the media is NOT the true gold price but the futures gold price and reflect what buyers of future gold dealers expect the price to be. The REAL price of gold is actually higher. This can be seen on ebay, for example, where the price of gold coins and bullion bars is substantially higher per ounce that the gold futures price. Buying gold has become so popular now that eBay has set up a Bullion Center where gold and other precious metals can be bought and sold. A lot of this has to do with the gradual devaluation of currency and much to do with the mounting debt that the US and Europe have been accumulating over the years. This mountain of debt does not translate into good savings and people are very much aware of this. It does not take an economics degree to understand that debt has tom be paid at the end of the day and cannot be starved off forever with further debt. Hence the massive scrabble to own gold and other precious metals. At least with gold you have something solid that is not going to deteriorate, does not wrack up debt and, importantly, keeps its value in times of crisis and the bullion Center is doing massive business as people flock to convert their life savings into gold. So the REAL price of gold is not some market force manipulating gold for a nefarious or other reason. The real price of gold is, to put it plainly, the street value of gold, and that is around 10 to 20 percent higher than the futures gold price offered at the end of the news daily by the media. 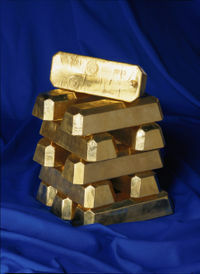 In the summer of 2008 gold was trading around 900 dollars an ounce prior to the GFC being revealed. Since then it has risen to $1,600 in late May and then over $1,800 just recently before pulling back to $1,784 a day or so later. American Gold eagles are now selling for over 1800 dollars an ounce. Checking the http://goldprice.org/ebay-gold-prices page, you can see the actual gold price in as much as what price people are prepared to pay to buy gold. Daniel Hirsch, a New York-based statistician who purchased over a dozen gold coins on eBay from Great Southern Coins, state that he started buying gold less than a year ago in an effort to expand his investment portfolio. It is a fact that people wish to invest in a stable option and when it comes to shares, the stock market, bonds and gold, gold wins hands down. And when you have gold and can assess the value in terms of the real price of gold you can be sure your asset is going to retain its value come what may.